Discussion in 'Mech Tech' started by jason meadows, Feb 9, 2019. Hi , I have set the valve clearances and timing on my bay , for some reason the rotor on the dizzy was pointing to about 7 o'Clock at tdc on no.1 so I connected leads accordingly . Tried starting but all I got was a few pops , no real firing . I read somewhere else that if I swap leads 1 and 3 and 2 and 4 it might start and get presto it did ,could rev but not tickover this has left me completely baffled. Anyone know why swapping the HT leads over made it start and could I damage the engine . Thanks in advance . If its started and sounds like it’s running on all 4 cylinders you have got the firing order right. I would get a timing light on it and check the timing. If its retarded it won’t tick over very well. Have you adjusted the carb settings? Firing order is usually engraved around the base of the dynamo stand. Saves remembering it. A good check to make sure your not 180 degrees out. With ignition turned off use a spanner to get no1 piston to line up with the top dead centre pulley mark, then turn it clockwise a little further and check that the no1 cylinder exhaust valve is the next valve to open in the sequence. Lasty and jason meadows like this. for some reason the rotor on the dizzy was pointing to about 7 o'Clock at tdc on no.1 so I connected leads accordingly . Tried starting but all I got was a few pops , no real firing . Sounds like you timed it 180deg out. Are you sure it was TDC on the compression stroke? ^this. Two TDCs for no 1. You need the compression stroke (both valves floppy). You need the TDC on the compression stroke, you’re probably on the wrong TDC. When it’s at TDC, waggle the no 1 rockers. If they’re both loose, you’re on the compression stroke (both valves shut). If one’s stiff, you’re on no 1 exhaust stroke. jivedubbin and jason meadows like this. 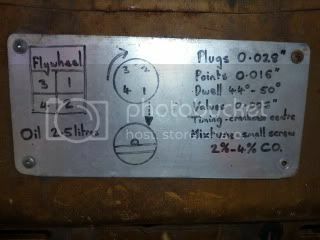 Here's my "aide memoire" kept in the engine compartment of my AS 1600 engine. Note the "slot" in the distributor drive shaft is towards the rear of the vehicle, parallel to the bumper. To time for a vacuum advance distributor…. Get the engine running and warm at whatever timing works. Disconnect and plug the vacuum tube. Set the timing so that maximum advance when revved hard is 28 degrees BTDC. I’ve treated myself to an adjustable strobe light for £30 – just dial up 28 degrees and turn the distributor until your new TRUE TDC mark lines up with the crankcase centre. nicktuft and jason meadows like this. Sort your valves first. Set the the crank at the TDC, give no 1 valves a waggle. If one's stiff, rotate the crank 360º: both should then be loose. Set the clearances for no 1. Rotate the crank 180º anticlockwise. No 2 should now be waggle-able. Set those. Another 180º anticlockwise, set no 3...etc. Then get back to no 1 on the compression stroke, and set the ignition timing at the 7.5º mark with a light bulb. As others are saying you’ve got to work out whether you are on TDC for 1 and not 3. I’ve never had success with the pencil method on this engine because you’re going in through the plug hole at right angles to the piston, so you won’t see it lift much. It just crushes the pencil. Ignore the "pencil-through-the-plughole" method, it's inaccurate. Find and mark the TRUE TDC. Mash out the insides of a spark plug and insert a length of threaded rod through it secured by a nut on either side. Adjust this so that about 10mm protrudes further into the cylinder than a spark plug would. Insert this into the plug hole and turn the engine by hand until the piston jams against the rod. Draw a temporary mark on the pulley where it lines up with the crankcase centre. Turn the engine the other way until the piston again jams against the rod and again mark the pulley. True TDC lies EXACTLY halfway between the 2 marks. I've filed a large new notch on my pulley and scratched "TDC" on it for future reference. You now have a true TDC you can rely on for the life of the engine. Valveandy, jivedubbin, 77 Westy and 5 others like this.